This adventure includes six ready-to-play characters. 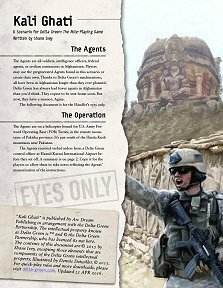 Publisher's blurb: "Kali Ghati is a scenario for DELTA GREEN: THE ROLE-PLAYING GAME. The Agents are soldiers, intelligence officers, federal agents or civilian contractors among the U.S. forces in Afghanistan. Thanks to Delta Green's machinations, all have been in Afghanistan longer than they ever planned. They expect to be sent home soon. But now, they have a mission. Again. "A fellow Delta Green agent has gone missing from an Army base in a troubled province. It's up to the player characters to find him before the disappearance draws the kind of attention that Delta Green cannot afford."